Discussed for decades, a car running on compressed air is verging on coming to the U.S market. But it's another power source – America's supply of unconventionally minded entrepreneurs – that will likely make or break the Compressed Air Vehicle. car that runs on air? Yeah, right. Get real, you might well say. • Mileage? 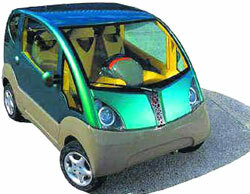 An estimated 106 miles per gallon (45 kilometers per liter), using either fossil or bio fuel. • Range between refills? 848 miles (1,365 kilometers), using eight gallons (30.3 liters) of liquid fuel. • Top speed? Ninety-six miles (155 kilometers) an hour. • List price? US$17,800 for the six-passenger, four-door CityCAT model. Shiva Vencat, CEO of Zero Pollution Motors (ZPM), which will build and operate the first CAV plant in the U.S.
Toyota's Prius Plug-in Hybrid (for more details on the CAV's technology, see accompanying "Under the Hood" sidebar). That's pretty eye-popping stuff – the kind that practically beggars belief. Skeptics notwithstanding, though, the site-selection process for the first CAV plant in the U.S. is taking shape, says Shiva Vencat, CEO of Zero Pollution Motors (ZPM), the New Paltz, N.Y.-based company that will build and operate the facility. "We will start looking for a site in the latter part of 2009," Vencat tells the SiteNet Dispatch from his office 85 miles (137 kilometers) north of downtown New York. "It will take about a year to build the plant, and we will begin delivering the first CAVs to American customers in late 2010 or early 2011." Customer proximity, of course, is a hardy site-selection perennial. But with the CAV, positioning manufacturing close to consumers is a bone-level imperative – given MDI's plans to eliminate all of the auto industry's myriad middlemen. Accordingly, ZPM has been doing its online homework, gauging U.S. consumer interest. "Many thousands" of American residents have registered interest via the Internet, Vencat reports. "Some want to receive more information about the CAV, and others want to be on the waiting list when the car comes out. I have to tell you, I haven't had the time to look at them all yet. I'm very busy, and there are so many to look at." Thus far, the heaviest demand is clustered on the country's opposite coasts. "The first U.S. plant is likely to be in the Northeast, where we are getting very strong interest in the CAV," Vencat says. "But there is also a lot of interest in California to bring the vehicle to market as soon as possible." Haven't heard of the CAV? That's not altogether surprising. The compressed-air car hasn't gotten the big-bucks buy-in that traditional automotive titans are lavishing on fossil-fuel alternatives like hybrids and hydrogen-powered fuel cells. MDI at the New York International Auto Show in March showed the three-passenger two-seater OneCAT economy model (above) that the company plans to sell in India. Pictured below is a rendering of the interior of the six-passenger, four-door CityCAT model that will be sold in the U.S. market. Similarly, the automotive press has only given the idea glancing mention – in part because there hasn't been much to write about. The CAV didn't make its first public appearance until March 20th at the New York International Auto Show. 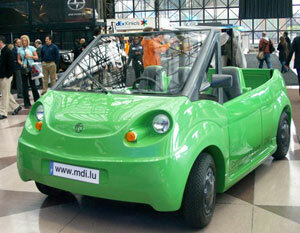 And though MDI has three running prototypes, it hasn't yet made a final model available for test drives. Low profile notwithstanding, however, the CAV has begun to generate a noticeable buzz. Time, for example, named the vehicle as one of "the Best Inventions of 2007." "Electric cars are so 2006," Time opined. "These ultra-eco-friendly cars run on air, and the only thing they emit is colder, cleaner air." But the bright idea behind the CAV is shadowed by some sizable clouds of uncertainty. One of the biggest potential complications: MDI's unorthodox business model, which puts very heavy emphasis on franchising. The Carros, France-based company isn't only looking at third-party investors to take over CAV dealerships; those franchisees will also be doing the manufacturing of the vehicles. "No one has ever done such a thing with franchising in the automotive market – never," Vencat acknowledges, a hint of pride in his voice. But the CAV, he believes, is an idea whose time has come. "In the next five years, I believe we will have over 100 factories worldwide producing a minimum of 400,000 vehicles per year," avers Vencat, who has been a vice president at MDI Inc. since the mid-1990s. "In the first decade, we believe we can reach 250 factories producing at least one million vehicles per year." If ZPM Builds It, Will They Come? MDI has a lot riding on the U.S. plant that ZPM's going to build. How that facility fares will go a very long way in determining the CAV's American fortunes. "ZPM is the first U.S. franchisee for the CAV," Vencat says. "ZPM is a company I incorporated to be the legal entity in which I will own my factory. Our factory will be the model plant for the American market. Once we get that plant going, that's when the other U.S. franchisees will take over and build the other plants." ZPM's site-selection schedule would be running drum-tight if the project were a conventional auto plant, where parcels and plants skew sharply toward jumbo size. With the CAV model, however, the emphasis is on a large network of smaller plants. "Yes, from a traditional viewpoint, it would seem that time is short in identifying ZPM's manufacturing site," Vencat says. 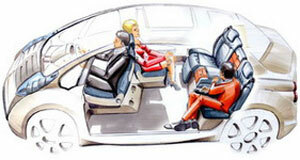 "But bear in mind that we need a lot less space than a traditional auto manufacturing plant. "We will need about four acres (1.6 hectares) of land for the plant site, and the building will be about 40,000 sq. ft. (3,600 sq. m.). We are estimating that the facility will have from 100 to 120 employees. In some countries where there are fewer skills, it may require more workers for each plant." 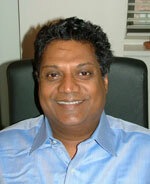 But acquiring additional franchisees isn't a make-or-break essential in MDI's short-term business plan. "We have enough working capital that we only have to have the first model plant running to sustain MDI in the early stages of U.S. operations," Vencat says. 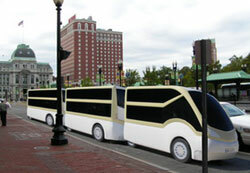 A rendering of MDI's MultiCAT, another compressed-air powered vehicle designed for use in public transportation. 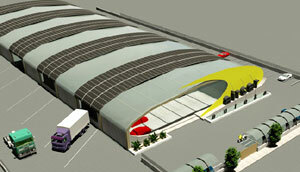 A rendering of the facility that will be replicated in all U.S. plants that manufacture the CAV. Prospective American franchisees, however, are materializing. Vencat says that 25 individuals in 25 states have requested more information about acquiring a CAV franchise. Worldwide, MDI says that it's signed 39 CityCAT "factory cooperation option contracts." And the company says it has another two option contracts to manufacture the MultiCAT, a large vehicle for urban public transport. Together, those 41 options span 17 countries. Candidates for CAV franchises will obviously need to bring some substantial capital to the party. "The global amount of the investment . . . to benefit from the licence and obtain the construction of a [CAV] concept factory is 12 million euros ($18.6 million) per factory, tax free," MDI's contractual document stipulates. "All taxes and fees applicable to conform to laws of the country in which the factory will be constructed . . . shall be borne by the contractor." Franchise holders will also pay MDI royalties on sales; royalties on 500 units are required in the first year of sales, rising to 1,000 in year two and 2,000 for every year thereafter. Franchisees, MDI's contract specifies, will also be responsible for providing – and selecting – the plant site and paying "for all work associated with that land." "Our business model requires that our franchisees will be looking for their own sites," says Vencat. "Since it's in their own backyard, they will have greater ability to identify the right site quickly." Franchisees, however, will not be building their own factories. That wouldn't comply with MDI's quality-control concerns, says Vencat. "MDI will be the project manager for the construction of all of the CAV plants," he explains. "Those plants will be built to conform to the prototype plant that MDI has built in France. So we will use local architects and builders, and it will be like building a McDonald's restaurant." But money alone won't determine who gets the CAV franchises. "Financing is a secondary issue," says Vencat. "This is a grass-roots movement. First of all, a franchisee has to have passion about the idea of the CAV. "Let's face it, if somebody is really passionate about the idea, they're going to go out there and get, say, 100 people to put up $20,000 apiece and buy the rights to a plant." For look at some of the CAV's technology click above, where you'll see a video demonstrating an early MDI prototype that ran on only compressed air. 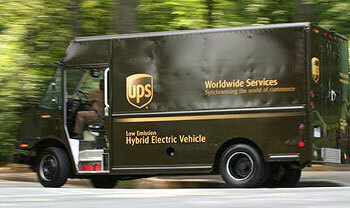 UPS: A major player in the CAV supply chain? Many potential franchisees, however, may well take a wait-and-see attitude before fully committing. First, they'll likely want concrete details about how MDI is going to handle issues like the CAV's supply chain and repair network. "MDI's business model is designed to provide solutions by simplifying the logistics," Vencat explains. "For our supply chain, we will have a central purchase company, jointly owned by all the franchisees, that will handle the purchasing of all parts and components. And we intend to use the UPS supply chain for delivering consumables to our franchisees. "We will have a just-in-time manufacturing policy as well to avoid inventory," he continues. "Our franchisees will use the Internet to take CAV orders. This will enable us to provide mass customization. If somebody wants their car to be white with black dots, they will be able to order that exact kind of car." CAV repair work will also be outsourced. "We intend to enlist small garages around the U.S. that we will train and provide with spare parts," says Vencat. "Our philosophy of repair and maintenance will be modeled on the computer industry, where you do not repair but only replace parts, sending the broken parts back to the plant. "We also intend to make strategic alliances with companies like NAPA or Midas to provide this type of replacement service nationwide," he adds. MDI's plan is unquestionably ambitious. But it all sounds like an awfully tall order for a company that's so small. MDI currently has 44 total employees – 40 of them at MDI's French complex near Nice, another four with ZPM in New York. "This concept has never been done before," Vencat allows. "I think the auto industry is looking at us like, 'These guys will never be able to pull that off. Or if they do, they're going to be a very small player.' "
MDI, he says, hasn't drawn any interest from major automotive manufacturers. The compressed-air car that Tata Motors is developing for the Indian market may look like MDI's MiniCat model, which is pictured in a rendering here. Except for Tata Motors, that is. 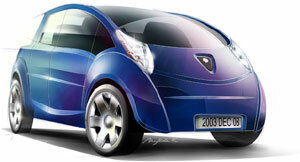 India's largest auto-maker, Tata in early 2007 licensed MDI's compressed-air technology for $28 million. The Indian company is now reportedly manufacturing a small Tata model that runs only on compressed air and may go on sale in India by the end of 2008. For the moment, at least, it doesn't sound as if MDI plans on entering any similar agreements. Says Vencat, "The Tata Motors deal is one of a kind and we do not intend to duplicate it elsewhere." Instead, Vencat again evokes the computer industry to paint a picture of what might happen. "Before the PC, you had all the big players – the IBMs, the Hewlett-Packards, the Compaqs – and they were all selling mini-computers and mainframes. And that was the market. That was it. "Then somebody put a small PC together in their garage, and the computer industry literally exploded. It got so big, in fact, that the big players started thinking, 'Well, maybe we should get involved too.' So this, I think, is what's going on now in the auto industry." What's going on with the CAV could get a major boost if MDI can steer the car to a win in the $10-million X Prize competition. Co-sponsored by Progressive Insurance, the prize will be awarded to the contender "that can design, build and bring to market 100-mile-per-gallon vehicles that people want to buy, and that meet market needs for price, size, capability, safety and performance," say X Prize officials. Sixty worldwide teams are entered in that prestigious competition. And some industry analysts are picking the CAV as one of the early favorites. Vencat's passion for the vehicle is certainly just as strong – or stronger. "I'm sure we're going to be among the X Prize finalists," he says. "I'm sure we're going to win it." n the surface, there's a deceptively straightforward elegance in the technology that will power the CAV's engine. Behind that, though, are 17 years of heavy-duty physics, engineering and testing. 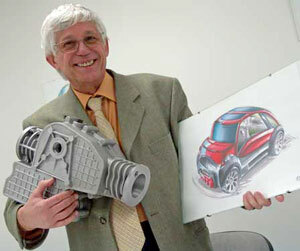 Motor Development International Chairman and Managing Director Guy Negre, the inventor of the CAV. The CAV's technology began as an idea revving inside the head of Frenchman Guy Negre. Already famed as an engineer for Formula One race cars, he studied the compressed air technology used to start engines at the tracks. By the late 1980s, Negre had developed a notion: Why not create an entire car running on compressed air? He started running down that dream by first fleshing out the concept, then attracting a number of investors. By 1991, Negre had founded Motor Development International. Low speeds: When the car is traveling 35 miles (56 km.) per hour or less, the engine runs only on air compressed to 4,500 pounds per square inch (31,028 kilo-newtons per square meter). The compressed air is stored in reinforced carbon-fiber tanks, which have a capacity of about 80 gallons (304 liters) and are attached below the chassis. Higher speeds: When the driver accelerates above 35 miles (56 km.) per hour, the CAV's computers automatically kick on a small fuel burner positioned between the motor and the compressed air tank. Fossil or bio fuel will power that heater, but not through traditional internal combustion. Instead, the heat generated by the burning liquid fuel is the central element in generating greater speed. Heat automatically adds volume to compressed air. So any boost in acceleration means higher volume in the air that drives the engine's pistons. Voilà, more power. Compressed air refills: Owners can generate a full tank of compressed air by plugging the car into a home socket. A recharge takes about four hours. Service stations may also offer compressed air refills, taking about three minutes to complete. The estimated cost of a full refill is less than $3. CO2 emissions: No federal regulatory agencies have yet certified just how low the CAV's actually emissions will be. MDI officials, however, promise that the car will be put through all of the usual regulatory wringers. In the meantime, they're saying that there will be zero CO2 emissions at speeds of less than 35 miles per hour. Driven faster, the CityCAT will emit 2.54 ounces of CO2 per mile (4.45 grams per kilometer), according to MDI officials. That's strikingly lower than the 1.192 pounds of CO2 per mile (333.8 grams per kilometer) that the average American auto puts out, according to data from the U.S. Department of Transportation. And the CityCAT's CO2 output is also considerably less than the 3.75 ounces of CO2 per mile (67 grams per kilometer) that's emitted by Toyota's Prius Plug-in Hybrid. Even so, some environmentalists are less than enthused about the CAV, in part because it still emits some pollution. In addition, the process of recharging the compressed air supply entails using energy produced at dirty-burning coal-fired power production operations. CAV supporters, on the other hand, counter that burning fuel at geographically remote power plants is more environmentally efficient than burning it in vehicle engines running on crowded roadways. That argument won't get settled here. This, though, is the in-a-nutshell picture of how the CAV engine works – at least on paper. How it runs in reality remains to be seen.